The Pied-billed Grebe is a small diving bird that is brown or gray in color. It prefers fresh water ponds and slow streams, but during winter when these freeze, it can be found on marshes, and tidal creeks. It feeds mainly on aquatic invertebrates, small fish and amphibians. Grebes are freshwater diving birds that are excellent swimmers and divers. Some species, such as the Pied-billed Grebe pictured above, are poor flyers and prefer to dive when in danger. Recent molecular studies have suggested that grebes are related to flamingos although their characteristics are significantly divergent. 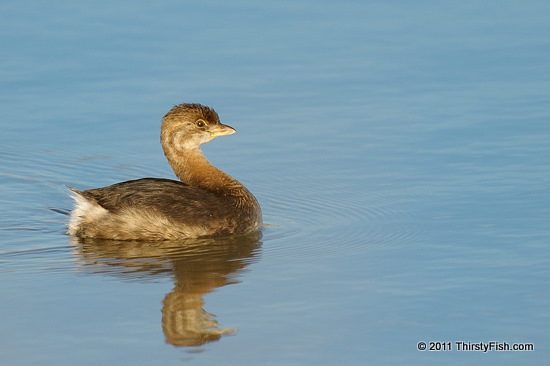 A larger cousin of the Pied-bill, the Atitlan Grebe, became extinct in 1989. Native to Lake Atitlan in the Guatemalan Highlands, the Atitlan Grebe numbers were declining rapidly in the 1960's due to the introduction of the invasive Black Bass. Through conservation efforts, the population had began to recover until the lake bed was fractured after the 1976 Guatemala earthquake. These unfortunate birds were last seen in 1989 and were later officially declared extinct... Sadly, if the bass don't get you, the earthquake will. When it rains, it pours.